Lindsey’s recent posts about walking make interesting reading… so I have borrowed her idea to describe a short walk in Somerset. The provisional title (which suggested itself last night in the bath), was “Not Lindsey’s walk”. That produced a chuckle, followed by the observation that I wouldn’t remember, which led along a train of thought about how to make a waterproof notebook, and then to the advisability of chuckling in the bath… but I digress. I usually like the implication produced by a definition in the negative. Commentators commonly describe modern democracy as the “least worst system”. “Not Lindsey’s walk” sounded pretty good at first, but it doesn’t have an obvious subtext. So “Ramblings” has won the day. The impulse to think about the world around you while walking isn’t a new one. Aristotle (384-322 BC) famously taught while walking around the Lyceum in ancient Athens. The word peripatetic describes this process and identifies disciples of the Aristotelian philosophical system. One such disciple, the poet Samuel Taylor Coleridge, extended Aristotle’s theories of the imagination, and it is with Coleridge, or more precisely with a statue erected in his honour, that this walk (from Watchet on the north coast of Somerset to Blue Anchor, a couple of miles to the west) begins. 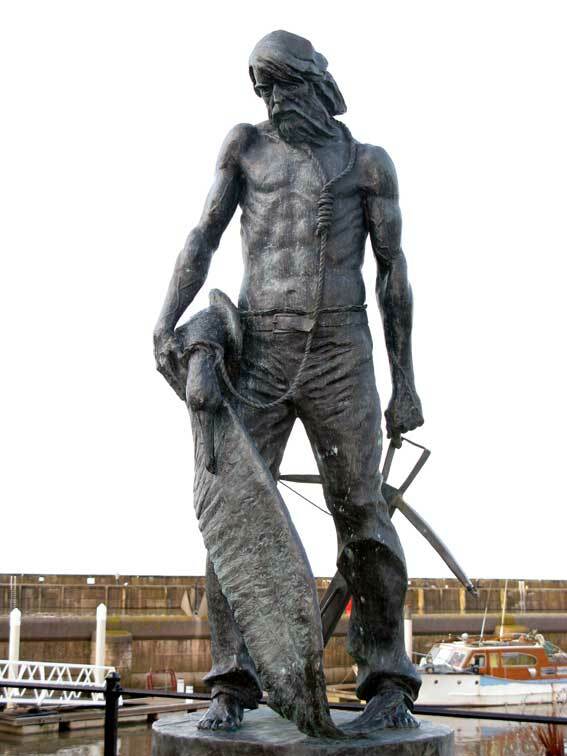 A statue of the ancient mariner, Coleridge's most enduring fictional creation, on the harbour-side in the Somerset town of Watchet, provides a starting point for this walk. 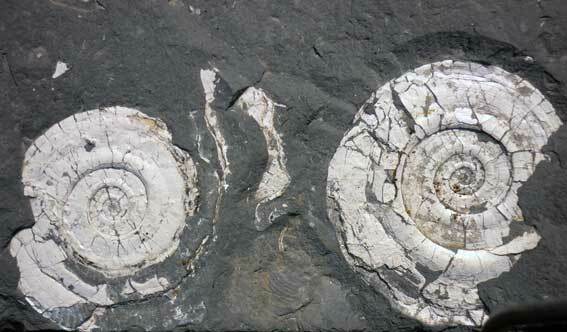 The coast between Watchet and Blue Anchor provides a window into a remote geological past when ‘slimy things did crawl with legs upon the slimy sea’. The slimy things are now almost magically transformed into fossils… As well as the rocks and the fossils they contain, there are fascinating plants and animals to be seen, and who could resist a journey on a steam train? 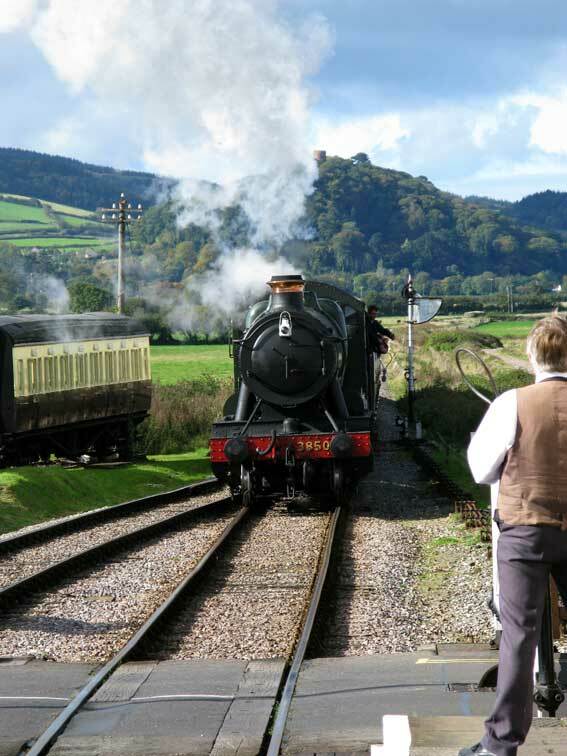 The West Somerset Railway runs a steam service most of the year and has stations at Watchet and Blue Anchor. There is a small museum on the harbour-side at Watchet, 100 metres west of the statue, which displays local fossils including a nearly complete ichthyosaur skeleton. Walking west from the museum a slipway at a gap in a row of terraced houses provides access to the beach. This is a good place to start looking for fossils. The blue-grey limestone pebbles in the bay commonly contain bivalves, and occasional mudstones preserve the spiral traces of ammonites. There are exotic foreign rocks here too, imported to provide sea defences for the town. Some of these contain fossils, but they are Carboniferous in age and not related to the local geology. The cliffs reveal a pattern of folds and faults that illustrate the complex forces that have moulded the landscape. The oldest rocks are red, and accumulated in an ancient desert environment. Younger rocks were deposited in tidal mudflats. 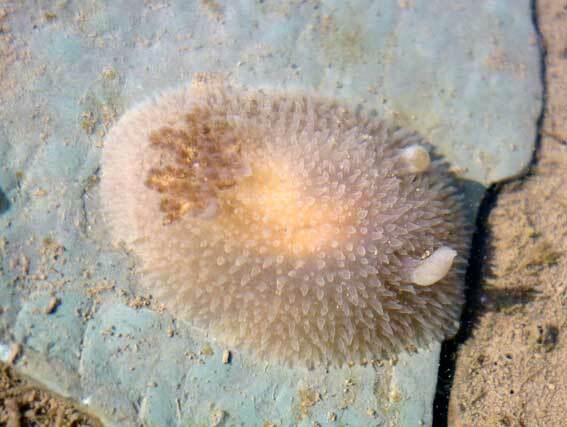 The youngest were laid down in warm tropical seas. The lost world they record existed 200 million years ago as the Triassic period ended and the Jurassic began. At that time, the landmass that is now the British Isles lay beneath tropical skies about 20 degrees north of the equator. The Variscan mountain range to the south and west, was gradually being worn away and by the beginning of the Jurassic period, warm shallow seas had replaced the desert. Three quarters of the way toward Blue Anchor the character of the rocks changes and the cliffs are veined with white to salmon-pink gypsum. In the Middle Ages the gypsum deposits were worked to produce alabaster for carving and to make Plaster of Paris. The gypsum veins are exposed in the cliffs for several hundred metres before a fault throws up older orange-red Triassic rocks. 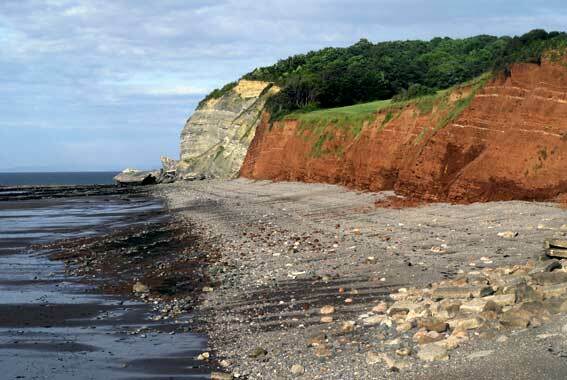 These Triassic rocks, known to geologists everywhere as “Red Beds”, remain all the way to Blue Anchor. Coastal cliffs and the seashore provide a great opportunity to wander in the hope that nature will reveal something interesting. All sorts of plants grow on the cliffs. 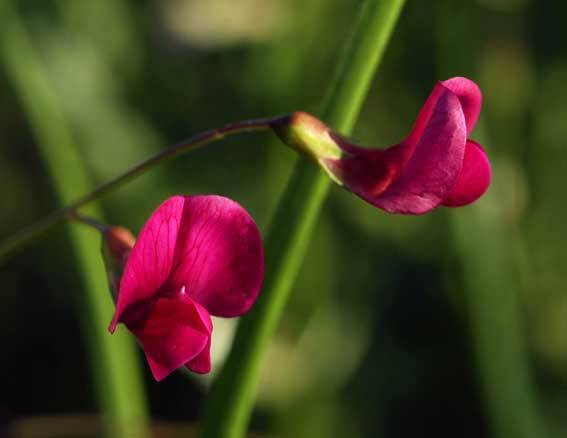 These include grass vetchling… a truly cryptic species, which although present in great abundance does a marvellous job of disguising itself as a member of the grass family, (at least, until it flowers). There are also orchids including the exotic greater butterfly orchid. Grass vetchling (Lathyrus nissolia), a truly cryptic plant except in Summer when its pea-like flowers are conspicuous. 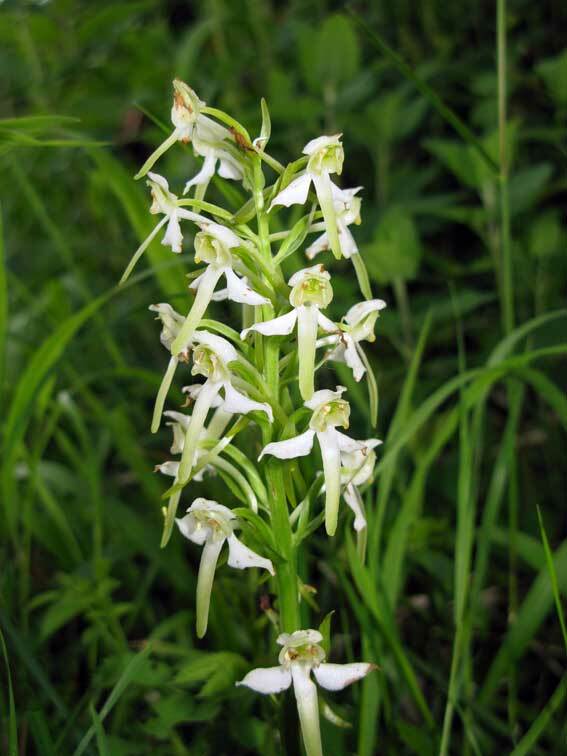 The greater butterfly orchid (Platanthera chlorantha). Note the long thin nectar-bearing spurs which can only be plumbed by the tongues of a few large moths. Sea shore animals include shore crabs and nudibranchs (commonly known as sea slugs, but rather more attractive than our common garden variety). 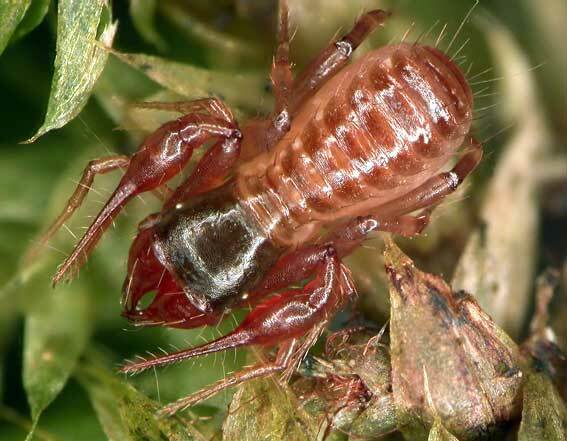 Recently, while looking at some geological specimens collected in the area I came across a very strange beast indeed… a pseudoscorpion. It will be the subject of another post, but I couldn’t resist adding a photo here! Different people have different perspectives on nature. Rocks and fossils or plants and animals aren’t everyone’s cup of tea! 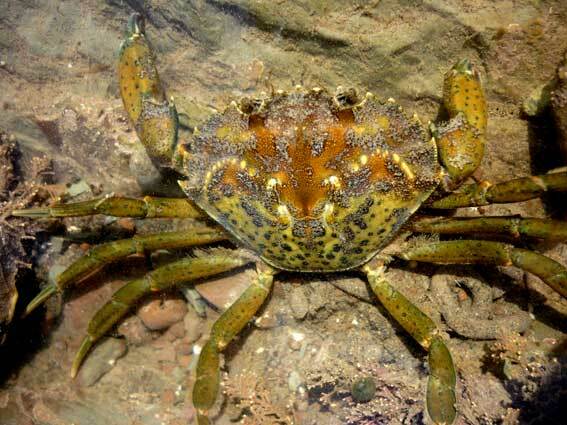 But this area of Somerset has attractions that can tempt even the hardiest non-naturalist. Foremost among these is the West Somerset Railway. This runs a steam service calling at both Watchett and Blue Anchor. A particular treat is in store in September, when the newly built peppercorn class A1 Pacific steam loco Tornado is making a guest appearance on the line. 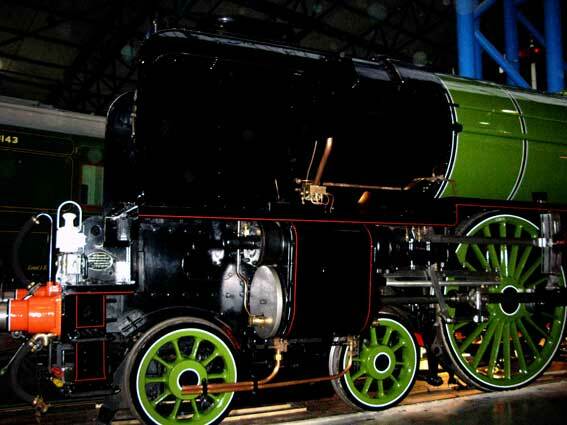 The newly built A1 Pacific steam loco Tornado at its unveiling at the National Railway Museum, York. A common sense approach when visiting the locations described is important. The cliffs between Watchet and Blue Anchor are tidal and the low and high tide times should always be determined. Do not start the walk on the seashore on a rising tide as the sea always reaches the base of the cliffs! This entry was posted in Uncategorized and tagged Aristotle, Blue Anchor, botany, butterfly orchid, celestite, Coleridge, definitions in the negative, fossil hunting, fossils, grass vetchling, greater butterfly orchid, philosophy, Poetry, Pseudoscorpions, Railways, Sea Slugs, Somerset, Steam Trains, strontium, Tornado, walks, watchet.